New goal - learn to make bread. 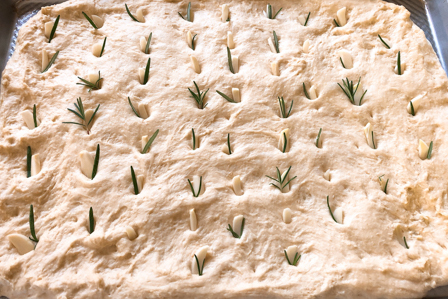 I started with an easy recipe, Rosemary Focaccia. The recipe is based on a class that I took back in 1998 at Home Chef. I've changed it to use Rapid Rise Instant Yeast. Made other changes as well. Make the rosemary olive oil by cooking sprigs of rosemary in olive oil over medium heat for 5 minutes. I do 1/2 cup olive oil, which is 8 tablespoons, so that I have plenty for the recipe. Let cool before using. In the bowl of a stand mixer with dough hook attachment, put the semolina, flour, salt, 4 tablespoons of the rosemary olive oil, and yeast. Combine a bit. Dissolve the barley syrup in the warm water. Note this will cool the water down, so start with it slightly over 130°F. Make sure it is between 120°-130°F before you add it to the flour mixture. Add it to the flour mixture. Combine well. Knead the dough until it is smooth. I do some of this in the mixer and some out of the mixer. Add a little flour, if needed when kneading by hand. Place the dough in a lightly oiled bowl, cover, and allow to rise until it has doubled in size, about an hour. Lightly brush some of the rosemary olive oil onto a 12" x 17" sheet pan. Place the dough on the pan and spread it out to conform to the pan. Using a sharp knife, make several small slits in the dough. Insert the garlic slivers, followed by rosemary sprigs into the slits. Preheat the oven to 400°F. 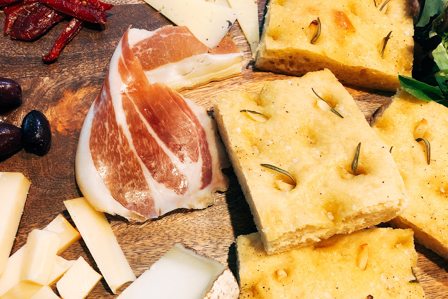 Allow the focaccia to rise 15 minutes while the oven is heating up. Use knuckle to make indentations in the bread. Brush the remaining rosemary olive oil over the bread, sprinkle with the salt and pepper. 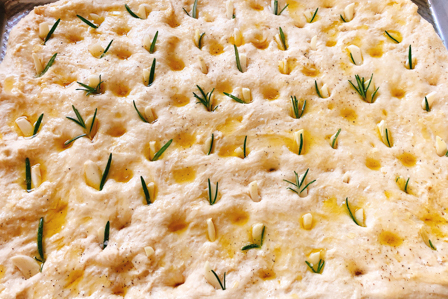 Bake the focaccia for about 20 minutes, until lightly browned. Removed from the pan and cool on a rack.